Do you want the assurance of better quality spreadsheets? Spreadsheet Check and Control: 47 key practices to detect and prevent errors, ISBN 190540400X, by Patrick O'Beirne, 204 pages, published September 2005, price €29.95. This spreadsheet book is quite different from every other book on Microsoft Excel. If spreadsheet users had a driving licence, this would be their seat belt, air bag, navigation aid, repair kit, hazard indicators, and the rules of the road. What the reviewers say about "Spreadsheet Check and Control"
Spreadsheet Check and Control does what no other book before has attempted to do; provide standards for designing spreadsheets that lend themselves to a logical review by management and internal auditors. Following this author’s guide and insight can help your organization minimize spreadsheet errors and facilitate audit review to prevent and detect those errors.’ Jim Kaplan, editor, AuditNet.org. ‘It is excellent. I am embarrassed when I think of the shortcuts I generally take with spreadsheets and I have often paid the price. I think it will become, and it should be, required reading for all young trainee accountants.’ Ciaran Walsh, senior finance specialist, Irish Management Institute. ‘It's super. I kept saying to myself, "Wow, I didn't know you could do that." A great job.’ Ray Panko, Spreadsheet Error Research, University of Hawai‘i. ‘I thought I knew a lot about Excel, but in the course of teaching me to be Excel-careful, O'Beirne taught me some new tricks and methods that both helped me build better financial models and track down errors.’ Simon Benninga, author of Financial Modeling, MIT Press 2000 and Principles of Finance with Excel, Oxford University Press, 2005. 'Save red faces all round by buying, absorbing and passing-on this book, especially if you personally develop spreadsheets or if your organization is subject to Sarbanes Oxley and related regulations. Avoiding even a trivial spreadsheet mistake may well pay for the book. Avoiding a large one may save your career.' Dr. Gary Hinson, consultant in computer audit, security awareness site NoticeBored.com. 'Probably one of the most important spreadsheet books ever written. Your customers and boss will be delighted with the increased usability, accuracy and reliability his techniques encourage. Be aware that the pages are packed with useful and usable advice, so the 200 pages is probably equivalent to 500 pages in many other books.' Simon Murphy, Codematic.net, author of XLAnalyst. 'An essential guide for serious spreadsheet users. This book goes a long way to help spreadsheet users adopt methods that will reduce errors and thereby improve the quality of the information vital to the success of all organisations.' P M Cleary, University of Wales Institute Cardiff, Wales. 'This is an excellent, easy to follow book containing the key practices that will arm the novice and self taught spreadsheet user so they can create well designed, reliable and error free spreadsheets.' CPA Ireland magazine review. 'Minimizing or eliminating spreadsheet errors is Patrick O'Beirne's focus in this visual 200-page book, which is geared toward software testers, business managers, or auditors sleuthing for fraud'. CA Magazine (Canada) review. 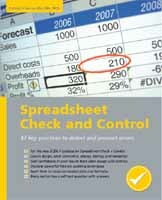 'Spreadsheet Check and Control is a unique book which encourage developers and users to use safety features in the development of spreadsheet applications. It provides techniques for the testing for accuracy to detect and prevent errors which make this book an excellent source of reference for the development of spreadsheets.' Dennis Cantellops, QAM US FDA, author of the US FDA Laboratory Information Bulletin 'Spreadsheet Design, Verification and Validation'. 'This title is an important contribution to spreadsheet quality control, a well designed self-teaching tool, and among the best texts on developing spreadsheet skills. It is the only one I have seen that focuses so well on a very important aspect of spreadsheet practice. It is thorough, compact, and comprehensible.' Major Keary, Melbourne PC User Group. Find out about a training course based on this book. It begins with the process of design, specification techniques, the use of appropriate documentation, security, backup, protection, and the development of conventions, formats and internal corporate standards. It recommends how to setup a spreadsheet, to construct and simplify the basic building blocks of formulas, workbook settings, and range names. It shows how to check for unusual settings, for example with rounding and precision, which are the source of traps for the unwary (‘gotchas’). A key section on debugging shows how to identify the causes of error values, methods of error handling, and how to detect missing inputs and calculations. It explains how common mistakes arise when structural changes are made, and common problems with known error-prone formulas and external links. It shows how to discover inconsistencies and mistakes, correct them, recover from incorrect operations, and create self-checking formulas. The display section shows how to uncover hidden and obscured data and formatting, how to discover problems with data types, and incorrect sorting and queries in database ranges. The use and abuse of charts is illustrated. The most important yet least practiced skill is of spreadsheet testing and review. Worked examples show how to create and run test cases, and how to build in cross-checks for internal control. Auditing techniques are described such as how to reveal hidden formulas, rows, columns, worksheets. Data integrity and validation are described. Appendices summarise error checking, keyboard shortcuts, websites, software tools, the answers to the ‘Check your knowledge’ questions, and an index. This book is for the ordinary office spreadsheet user who creates spreadsheets for themselves and others. They should already have spreadsheet skills corresponding to ECDL Module 4 (M4) or Advanced Module 4 (AM4). They can avoid the most common errors and make future development easier. Auditors or testers looking for evidence of fraud, such as deliberately obscured data or functionality, should also benefit from knowing the many ways in which good spreadsheets can go bad. The premier research group on spreadsheet errors is the European Spreadsheet Risks Interest Group, website www.eusprig.org. They have been researching the causes of spreadsheet errors and raising awareness of this serious issue. Their annual conference attracts speakers from all over the world to present on tools and techniques for the detection, correction, and prevention of spreadsheet errors. Barry Boehm, in his article “Software Defect Reduction Top 10 List” warned: “The ranks of 'sorcerer’s apprentice’ user-programmers will swell rapidly, giving many who have little training or expertise in how to avoid or detect high-risk defects tremendous power to create high-risk defects”. He proposed that to help reduce the likelihood of user errors, developers should provide the equivalent of seat belts and air bags in cars, along with safe-driving aids and rules of the road. The US Food and Drug Administration (FDA) have rigorous specifications for electronic records which includes spreadsheets used as laboratory log books. UK Tax Inspectors catch errors, omissions, and deceptions. The UK Customs and Revenue audit the tax returns for Value-Added Tax (VAT) submitted to them in spreadsheet form. The largest VAT error found in a spreadsheet in 2001 was around one million pounds. It certainly paid off for them to examine spreadsheets for errors. With the current focus on Sarbanes-Oxley section 404 compliance, business readers want to know how to exercise better internal controls on financial reporting, most of which depends on accurate spreadsheets. This approach to taking personal responsibility for user computing can best be characterised as 'internalised control'. This book enables users with the skills they need to check and control their own work. To buy the book, visit our shop. Find out about a training course for spreadsheet auditors. These are provided as Adobe Acrobat PDF files. If you have trouble viewing them, right-click on the link and select Save As to save the file to your local disk before viewing. Systems Publishing is a division of Systems Modelling Ltd, registered in Ireland.